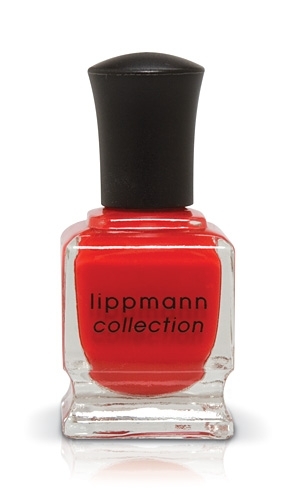 We all need a red nail polish. Some of need more red nail polishes than others. Because, as you likely know if you are reading this, every red is different. Some lean towards the orange end of the spectrum. Some are more blue. Some are dark, dramatic & vampy, and some are sheer and yummy jellies. 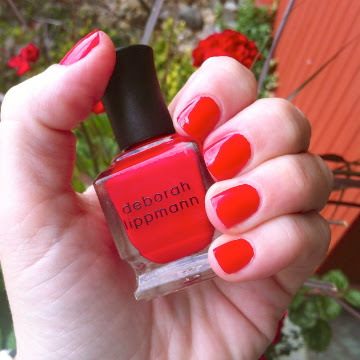 Somehow, Deborah Lippmann It’s Raining Men manages to straddle all of these categories and make itself The Perfect Red. Don’t get me wrong. It’s not The Only Red, as I don’t believe that exists. There are many Perfect Reds, and quite often how a particular shade of red works on one depends on skin tone and personal style. Check out the geranium in the background…glowing red! These days, I am enjoying a cheery red. A nice yummy bright red, with a little orange to brighten it up for warmer weather, but with enough blue in it that it doesn’t wash me out. Pure orange is not a good colour for me, but a rich Chinese red or vermillion has just enough orange to make the red pop and give it a glow. The closest dupe for this colour would be OPI Red My Fortune Cookie but Lippmann It’s Raining Men is just a wee bit bluer. A base of Lippmann Rehydrating Base coat, two coats of It’s Raining Men and finish off the mani with a coat of Lippmann Addicted To Speed and voila! A shiny juicy red!